Mon., 12 Aug. - Sun., 1 Sep. Situated in Rye Brook, this golf hotel is 0.8 mi (1.3 km) from Donald M Kendall Sculpture Gardens and 1.4 mi (2.3 km) from Purchase College. Performing Arts Center at Purchase College and Manhattanville College are also within 3 mi (5 km). HYATT house White Plains is a 5-minute drive from the city center, and 12 minutes from Westchester County Airport. Guests can drive 45 minutes to midtown Manhattan. Upscale shopping mall The Westchester is 2.5 miles (4 km) from the hotel. Located in the heart of White Plains, this eco-friendly hotel is 0.3 mi (0.5 km) from The Westchester Mall and 1.5 mi (2.4 km) from Westchester County Center. Galleria at White Plains and Pace University Law School are also within 1 mi (2 km). White Plains Metro-North Railroad Station is 23 minutes by foot. 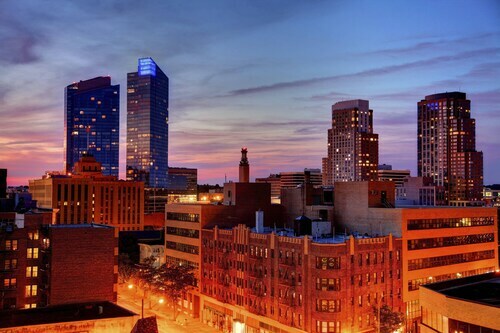 Located in the heart of White Plains, this hotel is within 1 mi (2 km) of Pace University Law School and Westchester County Center. The Westchester Mall and Galleria at White Plains are also within 10 minutes. White Plains Metro-North Railroad Station is 13 minutes by foot. 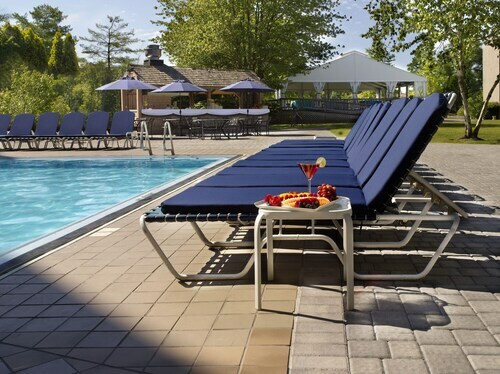 Situated in Armonk, this hotel is 0.5 mi (0.8 km) from Armonk Indoor Sports Center and within 6 mi (10 km) of Audubon Center and Haas Audubon Sanctuary. Westmoreland Sanctuary and Arthur W. Butler Memorial Sanctuary are also within 6 mi (10 km). Situated in Armonk, this tree house is 1.7 mi (2.7 km) from Armonk Indoor Sports Center and within 6 mi (10 km) of Purchase College and Haas Audubon Sanctuary. Jacob Burns Film Center Theater and Silver Lake Park are also within 6 mi (10 km). Situated in the business district, this hotel is 2.3 mi (3.8 km) from Manhattanville College and within 6 mi (10 km) of Capitol Theatre and Westchester County Center. Purchase College and The Westchester Mall are also within 6 mi (10 km). Situated in White Plains, this luxury hotel is within 1 mi (2 km) of Galleria at White Plains and Westchester County Center. The Westchester Mall and Pace University Law School are also within 15 minutes. White Plains Metro-North Railroad Station is 10 minutes by foot. Answer : The cheapest day to fly from Toronto to Westchester County is on Tuesday. So, if you would like to save a little cash on your next business trip look for flights on that day. Question : How long do most people stay in Westchester County? Question : What is the cheapest date to fly to Westchester County? Answer : Apr 30th has bookings (as of Apr 15th) as cheap as $363. That comes in 30% below the average price for this route. Saving on flight fares gives you more money in your pocket for your trip. Question : Is there an alternative airport near Westchester County? Answer : There is another airport outside Westchester County. LaGuardia Airport (LGA) is 22 miles away from HPN, and over the next two months flights are being booked 59% cheaper than flights to Westchester County Airport. Answer : You sure can and you may save by changing when you leave. The lowest-cost day to fly in April is Tuesday. You may be thinking you're missing out leaving a day earlier, but we see it as just adding those savings towards your next holiday. Question : What is the cheapest airline flying from Toronto to Westchester County? Answer : American Airlines is your best travel expert for finding that sought-after low fare. They're offering fares as low as $363, while rates for similar flights are as high as $621. Question : Which airline has the least delays from Toronto to Westchester County? Answer : Booking with Tradewind Aviation means you will arrive to Westchester County . In fact, this airline has a 56% average for getting there on time. It never hurts to be prepared. If you should choose this airline, be sure to track the flight status to stay on top of the departure time.